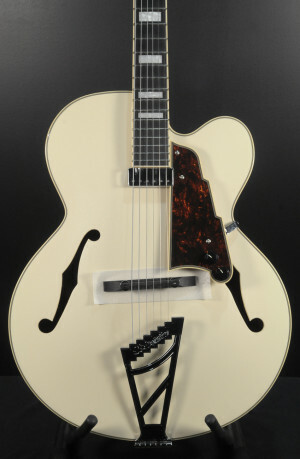 Designed, along the the rest of D'Angelico's Premier Series, to focus on playability, tone and signature aesthetics. The Special Edition Grateful Dead Bedford is not just a sleek, lightweight, solid offset-body guitar with tone that is versatile and organic; but a way to proudly carry your Deadhead colors with the signature "Dancing Bears" graphic. Featuring Duncan-Designed pickups, the combination of a stacked single-coil in the neck and a humbucker in the bridge position, along with push/pull coil-tap access, enables you to explore a wide range of tone with a unique look. A full-size 16” thinline in Eastman's new Antique Varnish. Deluxe Laminate Top, Deluxe Laminate back and sides with plenty of tone and attitude! This is my kind of guitar, a rock and roll animal. Here's a 1972 Gibson Les Paul Custom. It has had some mods: middle pickup added; a Badass bridge installed that entailed drilling new holes for the studs; and a Bigsby tailpiece was removed at some point. The pickups were changed to Seymour Duncan. Now here's the kicker, and it's a real kicker: Three, count them, 1 2 3 original Gibson Patent Number Decal pickups come with the guitar. How about that?! That's a thousand dollar value in itself. The tuners are Schallers. Bone nut. The pots date from 1972. The original sunburst finish is really cool. The frets are in excellent condition. There's the general amount of wear you'd expect from a 46 year old guitar. Overall the condition is very good. It plays and sounds great. It sounds great with the Seymour Duncan pickups, but you may prefer to put the original pickups back in it...your decision. It comes with the original hard case with purple lining. This is a great deal for a great guitar.